This morning when I woke I was craving one thing for Breakfast and was kicking myself in the bum for not making it the night before; a Protein Cookie. 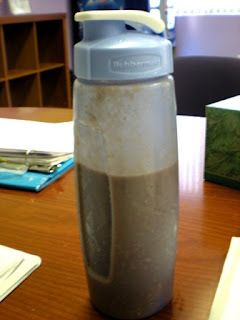 I decided to make a Protein Smoothie instead! A mixed together Kashi Oatmeal, 1 scoop of Chocolate LMM, 1/2 a Frozen Banana, PB, and Water. This turned out perfect and traveled well. 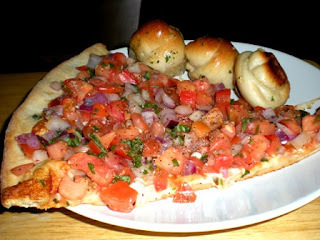 Ayer after my Doctor's Appt, I ran into the Italian Restautant next door and picked up a Margherita Slice and Garlic Knots. I love these slices because they are a perfect way to sneak in veggies. Oh btw it turns out my eyes are irritated and dry so I can't use my contacts for about a week =( and have to put lubricant drops. 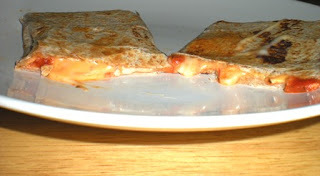 Last night for Din Din I made a Panini with a WW Wrap, Part Skim Mozzarella, American Cheese, and Marinara Sauce. 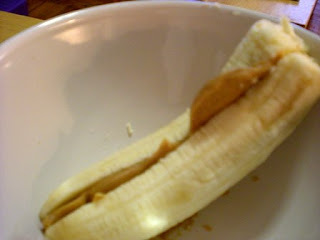 For dessert I had 1/2 a Banana with a smear of PB. Before Bed I played with my Wii Fit for 35 minutes and burned 237 Calories. Today after I drank my Smoothie, I did the Circuit at the gym for 35 minutes followed by 5 minutes of stretching and burned 401 Calories. 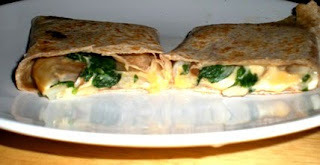 When I got home from grocery shopping, I made a Panini for Lunch which consisted of a WW Wrap, Sauteed Onions, Mushrooms, and Spinach, Roasted Garlic Hummus, and American Cheese (this was delish!). 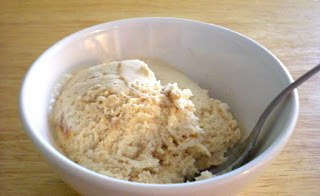 I picked up Ice Cream again but I am making sure to behave this time... so far I only ate 1 Cup of Breyers All Natural Dulce de Leche. While I was at the supermarket I picked up the movie A Perfect Getaway (a man sells bootleg movies by the entrance) so I am going to enjoy my purchase...have a great day! Holy cow I'm drooling over everything you eat! So much good food in those pictures! I definitely have my protein-craving moments as well. Although I have to admit, I am usually so very carb-centric.